It used to be that PR and SEO were two very different marketing tactics with virtually zero overlap. while SEO is more of a young whippersnapper with a history that reaches back a mere 25 years at best. Traditional PR is based on old-school, offline techniques, while SEO has been completely digital from the start. But in the late twenty-teens, it’s apparent there’s now a high degree of overlap between the two. Just think about it on the most basic level. One of the top ranking factors of SEO is links from high-quality, relevant websites. A sound PR strategy can be the catalyst for gaining these links and thus improving search rankings. When you think of it like this, it’s clear that PR and SEO are two marketing strategies you should focus on simultaneously. When you’re able to get them working in tandem, you can accomplish several important things. In this post, I’m going to highlight some strategies that will allow you to effectively combine PR with SEO for maximum success. I will also mention some specific outlets I’ve had success with. I’m sure you’ve heard me talking about personas before. Personas are a fundamental element of customer segmentation and key for getting the right marketing materials in front of the right leads. SEO is big on using audience research to unearth information about your customer base and segmenting them accordingly. PR involves doing media research to determine which outlets are best for reaching your target audience. For instance, a tech startup might be interested in media outlets such as Wired and TechCrunch. A vital first step of the process involves combining SEO audience research and PR media research to create an overarching persona. This will encompass your audience as a whole and will help guide you throughout the rest of the steps. I think we can all agree keywords play a significant role in SEO. Back in the day, simply using the right keyword density could often propel your content to the first page of the SERPs (or even the number one spot). Although they may not have the same level of impact they did several years ago, recent research from Backlinko explains that keywords are still important. So, yeah, they’re still a big deal. Although you may use a wide variety of keywords, depending on the topics you’re covering in your content, I suggest condensing them into a handful of keywords for PR purposes. You can think of it as a master list. To combine PR with SEO effectively, you need to have a finite number of keywords to target. As a result, those keywords will become synonymous with your brand. Reporters will use them when mentioning your company; your demographic will associate them with your brand; and so on. When it’s all said and done, when people enter these keywords in their searches, your brand should appear in the SERPs. The bottom line is you want to choose your keywords carefully and make sure they fully describe your brand. Just like you’ll want to achieve consistency with your keywords, you’ll want consistency with your overall brand message. You want to make sure whoever is representing your company understands your brand’s core message and relays it to the outlet they’re using. Whether it’s an executive having an interview with a news outlet or your content team writing a guest post for an industry publication, there needs to be a sense of cohesion. I recommend creating a formal document that outlines your target keywords and brand message you’re looking to get out there. Providing this to your team should minimize any confusion and ensure everyone is on the same page. Let me recap what I’ve discussed so far. You’ve created an overarching persona, established a list of keywords to target and developed a unified message for your PR and SEO teams to use. At this point, you’ll want to research potential channels (online and offline) you can use for your combined PR/SEO campaign. Ideally, you’ll target a variety of different channels so you can achieve a nice balance and reach the largest possible portion of your demographic. This shows the multitude of ways you can go about it. But for maximum effectiveness, I recommend narrowing it down to a manageable list of just a few channels initially. You don’t want to spread yourself too thin or risk diluting your brand message by trying to be featured on a million outlets. Keep in mind you can always expand later, once you’ve got things popping. With that being said, there are five specific outlets I suggest focusing on right off the bat. I’ve had tremendous success with all of these, and I know you can benefit from them as well. If you can land some real estate in a major publication in your industry, the world instantly becomes your oyster. Like I mentioned before, getting featured in Wired would be huge for a tech startup’s PR. And the link could take its SEO to the next level. Not to mention the surge in referral traffic it could generate. I suggest identifying a handful of leading publications and pitching them your ideas. Getting key influencers to endorse your brand can send your brand equity soaring through the roof. Check out this post I wrote to learn the fundamentals of getting promoted by social media influencers. It’s amazing the influence today’s top bloggers have and how much money is generated from their blogs. For instance, Brian Clark’s CopyBlogger earns around $ 1 million each month! I’ve always been a sucker for guest-posting and recommend reaching out to major bloggers as an initial first step in your PR/SEO conquest. Besides the valuable links and instant exposure you’ll get, this can have an impact on your branded search volume as well. People will naturally be curious about your brand, and many will search for you. Interviews are a huge reason why I’ve gotten to where I’m today. For instance, this interview on Groove HQ was a tremendous help. It’s well worth the time to seek out interview opportunities. If you’re not sure how to go about this, check out HARO. Believe it or not, I’ve spoken at hundreds of conferences. I’ve spoken at Tech Cocktail Celebrate, Conversion Conference and Affiliate World Bangkok Asia, just to name a few. It’s had a profound impact on my brand. While not every conference will be worth your time, the PR boost can be dramatic. Check out this resource from Famous in Your Field for information on finding speaking opportunities. It’s interesting how PR and SEO have evolved over the years. Though they were once disparate marketing tactics, they now overlap in a big way. When you get right down to it, PR often impacts SEO. As your link profile grows and expands, your rankings climb and improve. But this doesn’t just happen on its own. In order to combine PR with SEO, you need to have a solid strategy and know which direction you want to take. You need to know which underlying persona you’re looking to reach, which keywords you need to target and which outlets enable you to gain the publicity you’re looking for. But once you break it down, the formula is fairly straightforward. With proper planning and execution, you can rev up your PR while stepping up your SEO. Which areas of PR do you think have the biggest impact on SEO? Our just-released 2017 State of Social Marketing Report shares survey results from 2,738 social media marketing professionals from 111 countries. This report shares real-world insight and understanding of a dynamic industry where new networks emerge, old networks evolve, and the user base continues to rise at rapid rates. 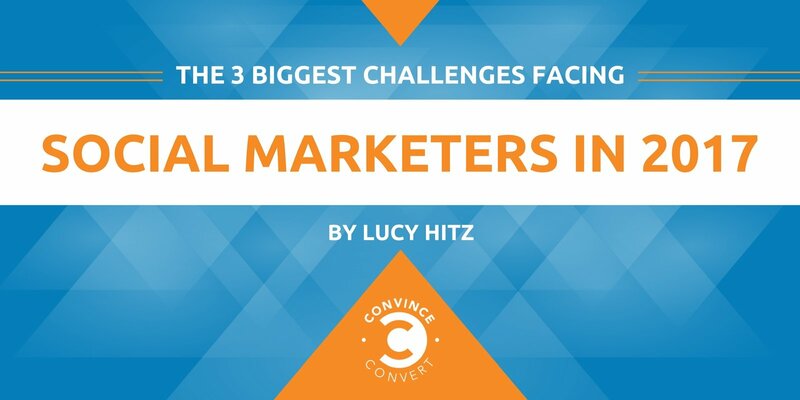 Here are the three biggest challenges social marketers are facing right now, according to social marketers themselves. Measuring ROI was listed, again, as the biggest challenge to 58.7 percent of marketers in 2017, compared to 61.1 percent in 2016. 33.6 percent of respondents claimed that tying social to business goals is also a major challenge. This year, the social media industry placed higher emphasis on collecting and analyzing social data, so we included two new categories to gauge whether they presented challenges to marketers. In total, 12.2 percent of respondents said collecting social data was a major challenge, and an even higher 24.4 percent struggle to use social data to inform marketing strategies. The challenges presented by both brands and agencies were very similar, but there were two noticeable differences. 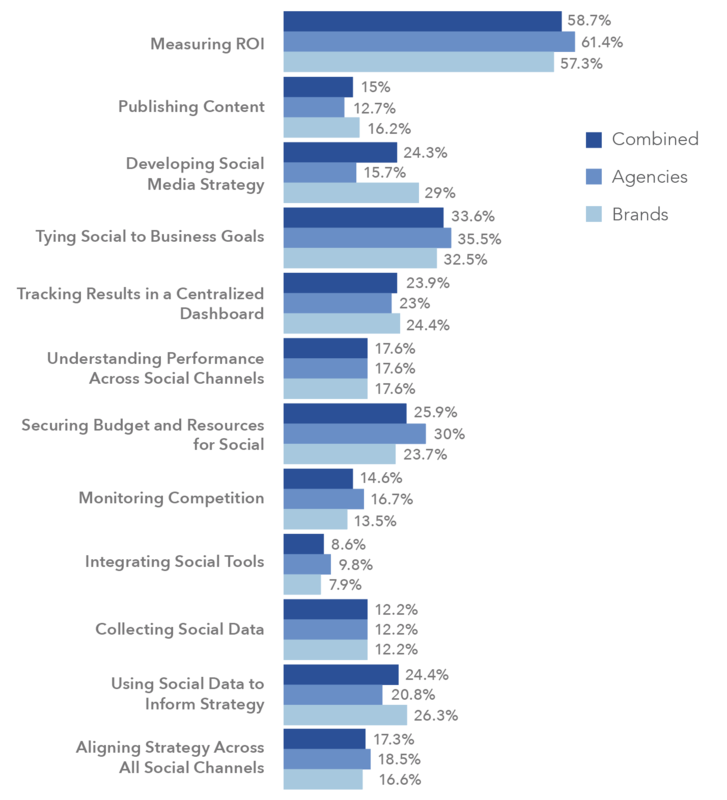 First, brands reported struggling more than agencies in developing a social strategy: 29 percent of brands versus 15.7 percent of agencies. Marketers are spending record amounts of money on social advertising. By the end of 2017, social network ad spending could reach $ 35.98 billion, representing 16 percent of all digital ad spending globally, according to eMarketer. However, there is a large disconnect between dollars spent and how those dollars are supporting strategic traffic and conversion goals. Only 31.6 percent of all marketers claim to have both web traffic and conversion goals for social. This means 68.4 percent of marketers are not establishing deliberate goals for both traffic and conversion, or are completely avoiding setting goals altogether. 26.9 percent of brands said they have both web traffic and conversion goals for social. 22.1 percent of brands reported having only web traffic goals, and 8.1 percent that said they only have conversion goals. A majority of brands do not have any goals set for either web traffic or conversion: 42.8 percent reported having neither. Goal-setting seems to be a higher priority in agencies, taking into account client expectations that agencies consistently set and surpass stated goals. Only 27.4 percent of agencies, in comparison to 42.8 percent of brands, reported having neither web traffic nor conversion goals. This is 15.4 percent less than what brands reported. 41 percent of agencies are actively setting both traffic and conversion goals. A combined 31.6 perent have set goals for either traffic or conversion. Analytics software was selected as the most-needed resource for marketers in 2017 to do their best work, by both brands and agencies. Brands reported almost evenly that analytics software (44.8 percent) and the need for more personnel specifically focused on social media (44.2 percent) are what marketers need most. 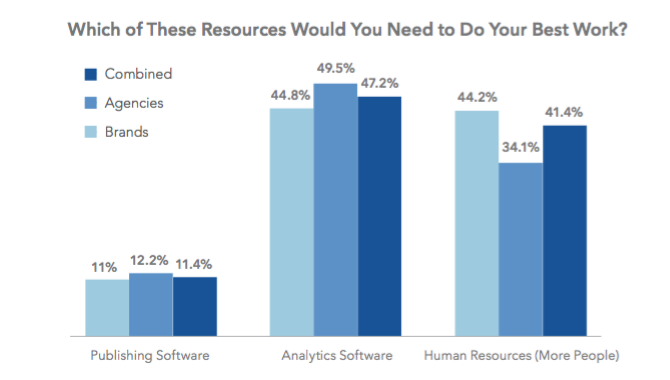 Nearly half of agencies (49.5 percent) reported the need for analytics software to optimize social strategies, and 34.1 percent identified human resources as their greatest need. 11.4 percent of brands and agencies said publishing software would help them do their best work. Despite the great need for analytics software, marketers are having trouble finding the funds needed to acquire all of the software they need. A majority of brands (42.8%) do not have any goals set for either web traffic or conversion. Download the full report (including the latest data from all major social networks) here. Editor’s Note: This blog post is part of a paid partnership between Simply Measured and Convince & Convert. From new brand identities to major ad campaigns, CMOs from StubHub, Peloton and more share their top moments during the last 12 months. A new report released by eConsultancy, in collaboration with Oracle Marketing Cloud, has revealed precisely which channels marketers feel deliver the biggest impacts on their return on investment, and how they bring those priorities to light within their respective teams and companies. Looking carefully at this chart, you’ll see why there’s such a disconnect between marketing investment and marketing results: paid search was the only channel where at least 50% of respondents noted that they felt “good” about ROI measurement. Other channels, including email marketing for acquisition, and email marketing for engagement and retention came close, but as the report notes, only a handful of companies would rate their confidence as “good” in these areas. Note the considerable drop-off after this point – automation, analytics, even content marketing takes a notable hit here. If you’re thinking budget woes stem from a tight squeeze on marketing spending (on account of a lack of provable, measurable results), that’s not quite the whole picture. Nearly 75% of respondents on both the client and supply sides expected their digital marketing technology spending to increase. However, a little over half of those same respondents acknowledged that it was easier to get executive buy-in and support to increase those budgets. This means there’s still quite a bit of work to do to convince the board room that these efforts are simply stepping stones toward the bigger picture of measurable results that they’re seeking. There’s a lot of talk in marketing circles about “the customer experience” – but just how much of an impact does it have on spending? As it turns out – a lot. Making sure the customer experience is seamless across all channels is an area of significant focus for marketing, sales and customer service teams alike, and having consistent, measurable results are at the core of marketing technology investments. Because so much is being funneled into measuring and realizing the customer experience, precious little of the budget can be afforded to try more innovative and untested strategies. More money is going toward acquisition efforts than engagement and retention, although as other studies have shown, this may very well be an exercise in focusing too much on quantity versus quality. And with so much of a focus on only measurable strategies with quantifiable results, innovation is hurting as well. Only 35% of those surveyed agreed that they reserved a portion of their marketing budgets for more maverick, untested strategies – a sharp downturn from the 46-37% range from previous few years. That being said, budgets are increasing not only in customer acquisition and lead generation, but also in other areas as well – namely email engagement and retention, acquisition over social media and data management. Look at the marked decrease in organic SEO. With paid search as one of the consistent ROI confidence forerunners, it makes sense that natural search is slipping. Considering that search engine algorithms and updates become more and more complex, creating tools and platforms to accurately measure them has become harder and harder. But also note the increases in areas such as email marketing, affiliate marketing and automation. Our tools for measuring the “people side” (as opposed to the algorithm side) of things are becoming more intuitive. The focus goes back to the customer experience, coming full circle in giving managers and other top level executives the measurability they crave while investing in a marketing plan built for consumers, not robots. So the question then becomes “how do we get measurable proof of ROI in campaigns if we don’t have tools to measure it?” After all, everything from investments to innovation hinges on those numbers. So even if the campaign platform itself falls short in giving you the tools you need to dig deeper, you still have a secret weapon on your side: Kissmetrics. By using Kissmetrics, you can track multiple types of marketing campaigns and gauge their effectiveness accordingly. Kissmetrics intelligently segments customers into different channels, which tracks visitors based on where they came from (social campaigns, pay-per-click channels, organic search and more). Not only does this show you which areas are worth your attention and spending, but also distinguishes between where traffic is coming from versus where customers are coming from – and that’s an important distinction. What’s more, you can track these same users across the customer journey – from the moment they become acquainted to your service until they complete checkout – and beyond. So if you’ve been struggling to wring measurable ROI out of things like social media campaigns, these kind of reports can deliver the insights you’ve been looking for, along with the concrete numbers beloved by the boardroom. With all this talk of marketing investment, return-in-investment, budget buy-in and confidence, you could say that a great deal of stress in trying to “prove” the best outlets for spending is putting increased pressure on today’s marketing teams. That being said, however, our focus is shifting more toward measurable results as they relate to people, not programs – paving the way for more insightful tools that help us unlock a bit more of buyer behavior as we continue to map the customer journey. But as marketers reading about marketing spending and measurement, we’d like to hear what you think. In your own experience, have you found the findings noted here to be true for your own work? Or do you feel that the end goal as to what constitutes “measurable” is constantly being moved? We’d love to hear your feedback and thoughts, so why not share with us in the comments below? About the Author: Sherice Jacob helps business owners improve website design and increase conversion rates through compelling copywriting, user-friendly design and smart analytics analysis. Learn more at iElectrify.com and download your free web copy tune-up and conversion checklist today! Follow @sherice on Twitter, LinkedIn or Google+ for more articles like this!